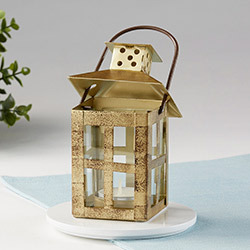 Sure to cast a golden glow on all who behold it, Kate Aspen's small Vintage Antique Gold Distressed Lantern will surely be the talk of the town at your wedding, bridal shower or special event. It is sure to fit into your rustic décor scheme. 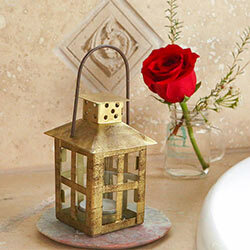 Gold metal lantern with vintage distressed details; glass windows and metal wire swing handle. Lantern is hand wash only. Lantern measures 2.5" w x 4.75" h x 2.5" d (6.7" h with handle); Packaged product measures 3.6" w x 5" h x 3.6" d.